WHY: We already know I adore Wooden Shjips. It should logically follow that anything Shjips honcho Ripley Johnson is involved in, I will more than likely be more than a little into. Enter Moon Duo's 2012 effort Circles. 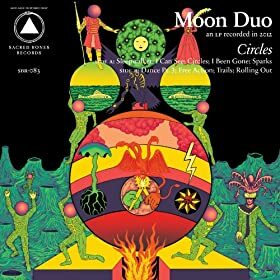 Definitely in the same vein as Wooden Shjips, Moon Duo takes the hazy, crazy, skillfully scattered psych rock that is a Wooden Shjips hallmark and flips it on its head, speeding things up, adding in traces of poppiness and throwing in beats that you can almost, dare I even say it, cut a rug to. Pretty much masterful. MY JAMS: "Sleepwalker" "I Been Gone" "Sparks" "Dance Pt. 3" "Free Action" "Rolling Out"